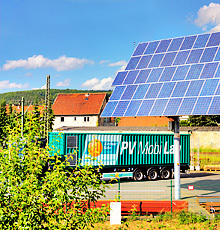 Photovoltaic installations are exposed to various influences during their operational life. To avoid losses of revenue (e.g. as a result of loss of performance or gnawing damage), defects or damage, regular and comprehensive maintenance by trained service technicians is recommended. The comprehensive service offered by Kirchner Solar Group includes, for example, yield monitoring systems, regular inspections of the installation elements, shade checks, thermal imaging tests using infrared cameras or performance measurements. The basic element of all maintenance contracts is the access to the company’s own monitoring system „Solarpilot“. By entering the individual yield data the performance of the installation and freedom from interference can be checked. For larger installations the purchase of a WebBox is recommended. The WebBox enables automatic yield monitoring and failure reporting. It continuously collects operating data and makes it possible to check the status, yields and performance of the installation at any time.